We spent the day at Parlee Beach in Shediac, New Brunswick and it was Athena’s idea of a dream beach. It offers a playground, soft sand, warm, shallow waters, life guards and bathrooms. 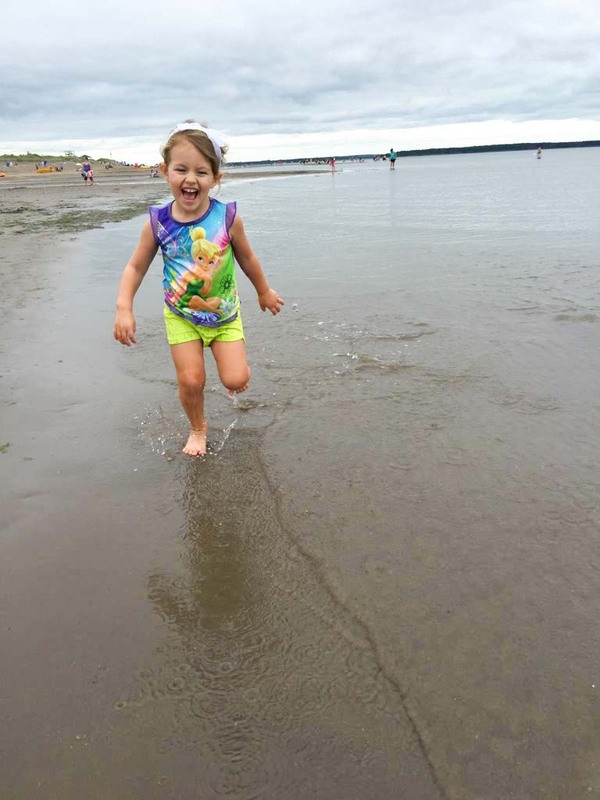 Athena and I will be spending most of our three-week New Brunswick vacation at Parlee Beach because it doesn’t get any better than this. As soon as we arrived, Athena took off her shoes and ran in the soft sand. It was clean with minimal rocks or seaweeds. The recent rain showers made it damp just below the surface and fantastic for sandcastles. We sat and played while looking out at the calm ocean. When we did get in the water, it was extremely warm in comparison to the cold Pacific. As if that wasn’t enough to put a smile on our faces, it was shallow for hundreds of feet. Athena ran, splashed and played and I didn’t need to worry about her going out over her head. Can you see how far out people are standing? It’s awesome for kids. Athena’s favorite part of the morning was searching for crabs. They were tiny and didn’t bother us while playing. She liked watching them poke their heads out of the shell and placing them back in the water to scurry away. It’s encouraging to see how gentle she is with all life and how little fear she has for things that once scared me. We stopped at the playground before heading home. 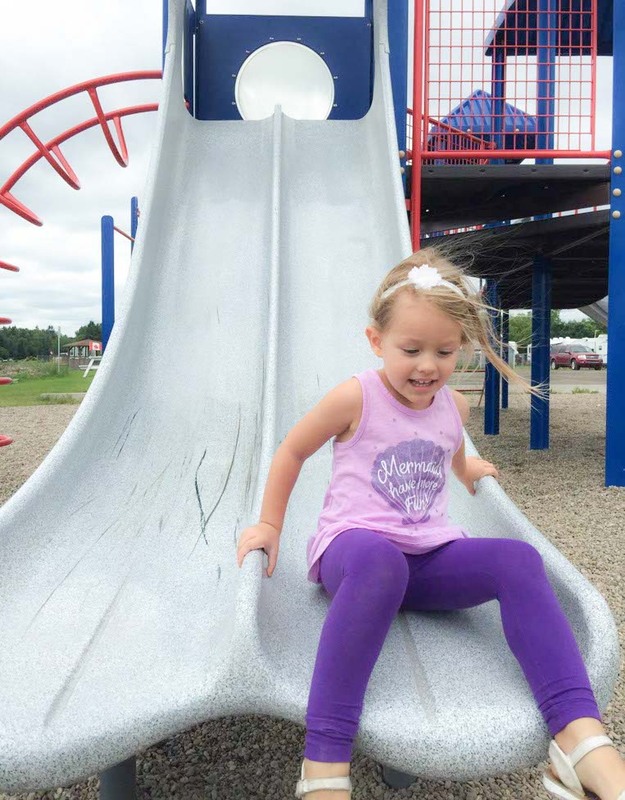 It has swings, slides and a few climbing structures. I could see her eyes grow tired from all the fun and excitement but I wanted to stay as long as possible. There’s no question that I love extreme adventure. Put my on the wing of a plane or upside down in a cockpit and I will glow with happiness but watching Athena play at the beach brings a different joy of joy into my life. It’s simple and beautiful. It’s impossible not to smile and feel complete when you’re watching your child laugh and play. We have a few plans tomorrow including Resurgo Place and swimming at my brother’s pool, but I’m hoping to find time for the beach every day while we’re here. 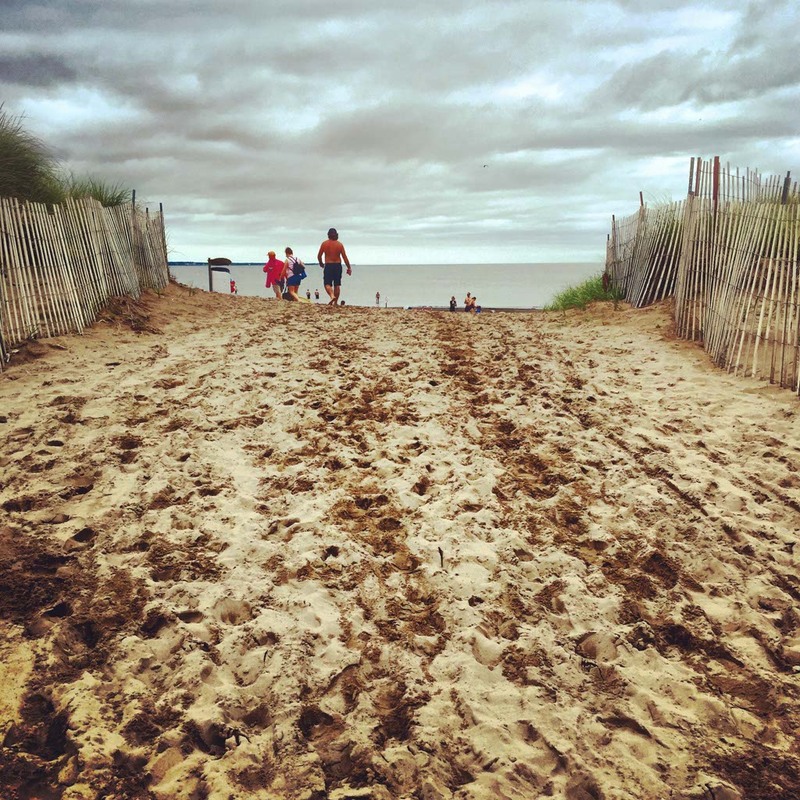 This entry was posted in Canada, New Brunswick, Travel and tagged beach, Daughter, Family, family travel, Mother, New Burnswick, Parlee Beach, travel by lesleycarter. Bookmark the permalink. What an awesome day at the beach. Thank you for sharing! I love the beach, need to get to Rehoboth before the end of the season. Parlee Beach is great. I’m glad you had a great day and can’t wait to read about your visit to Resurgo as I’ve been looking into taking Emiky there. If Athena likes butterfly, you should take her to butterfly world at the boardwalk. It is small but Emily always wants to go. It’s all about being surrounded by butterflies…. I hope you enjoy your vacations. It will be my first time at Resurgo but I will let you know how it goes. The zoo is small when comparing to the big ones out there but it’s lovely. Magic mountain water park is fun but I find it’s always too crowded for my liking. We have treego (zip lining and playing in the trees) at Centenial park. They have a course for kids but il not sure what the height requirement is. Centenial park as water features and a pool. Nothing to compare to Parkee beach but it will do the trick on a hot day. Lobster cruises out of the Pointe du Chene wharf are fun if you like lobsters. Hopewell rock is a must do if you want to walk on the ocean floor but be sure to verify the schedule for the tides. At the boardwalk, after butterfly world, you can play mini-golf. This is always fun too. I am sure we have other things to do too with a little lady like Athena :). It’s just been awhile since Emily was little. I think we’re going to Broadleaf too but I’m not sure yet. I’d like to include the drive-in as well but I’m asking for a lot. I can’t help myself. I like to stay busy. I’m totally adding Butterfly World. Is mini-golf there? Athena has never played mini-golf but I’m sure she would have fun. I did good with my suggestions. :). I’ve been to Broadleaf with work as a team building activity. I had never been on a horse but I enjoyed it. Does Athena ride? Emily does therapeutic riding and loves horses. Her coaches feel like she could ride that kind of horses on her own. It’s a nice ranch on the way to Fundy. Mini-golf is at the Boardwalk. They have some other games there too. Its on Mountain road on the left just before you will turn for the zoo and magic mountain. Emily is 17 but relates more to younger kids than she does with her peers. She’s mentally much younger but physically looks 17. It’s challenging sometimes but I get to constantly see the excitement you see now in Athena. Sand, tiny crabs, butterfly, zoo animals… She holds my hand and appreciates everything like a younger kid would. She loves all animals and discover activities on her own time. This year she started to sail on the Shediac Bay. She really likes it. Butterfly and the mini-gold are both on the boardwalk. I just realized I never answered your question. Try visiting Magnetic Hill while you’re there in New Brunswick. It’s a neat little side-trek if you happen to find yourselves in Moncton. If you’re going on into Nova Scotia, then definitely stop off at the Bay of Fundy! Highest tides on Earth! Athena is a little too young to understand Magnetic Hill but I’ve done it a number of times. I love that area, especially Magic Mountain. The Bay of Fundy is on our list but we will visit in New Brunswick. We’re going to camp in that area. (It will be Athena’s first camping trip.) We may stop at Cape Enrage too. Have you been there before? All the hill is is an optical illusion. If she knows what those are, then just say the hill is a real-life one. Or, just say there’s a huge magnet at the top of it — that’ll work, too. Fundy’s best as an all-day visit, because you’ll need at least six hours to get the full spectacle. As for Cape Enrage, I haven’t been there (yet) — what’s there to see/do? I remember when I was a child of about ten we use to go fishing down in Mexico (I lived in San Diego). One of my favorite activities was to chase these tiny soft sand crabs. They would wash in and out of the tide and could bury faster than I could reach them. It kept my sister and I occupied for hours running in and out while my parents shore fished. It’s so beautiful what interests kids. Is your sister older or younger? Is it just the two of you? I think she recently had a growth spurt. I can even notice the difference. Yes, she seems so much taller. Glad that you found a beach that was fun. Although I have never had a child I can see how things would change. I feel that way about where we moved and seeing things through different eyes! Thank you! My mom keeps telling me how special and wonderful it is as a grandmother. Hopefully, I will know that feel as well. How many grandchildren do you have? I loved learning as a parent that watching my children having fun and being happy, was as rewarding as when I did so myself! Three weeks together – how wonderful! Not only is it three weeks together, it’s three weeks surrounded by family and friends. We haven’t been home in over a year so we’re soaking it up. What are your plans for the rest of the summer? Next stop, Prince Edwards? It is a beautiful summer destination. The descriptions laid back, idyllic, pastoral, breathtaking equally describe it. Such joyful pictures of Athena. She is a sweet and beautiful little girl.I want to go to the beach now!!! Boy does she look happy! Seems like you had a nice day! Sounds like such a fab place to be! 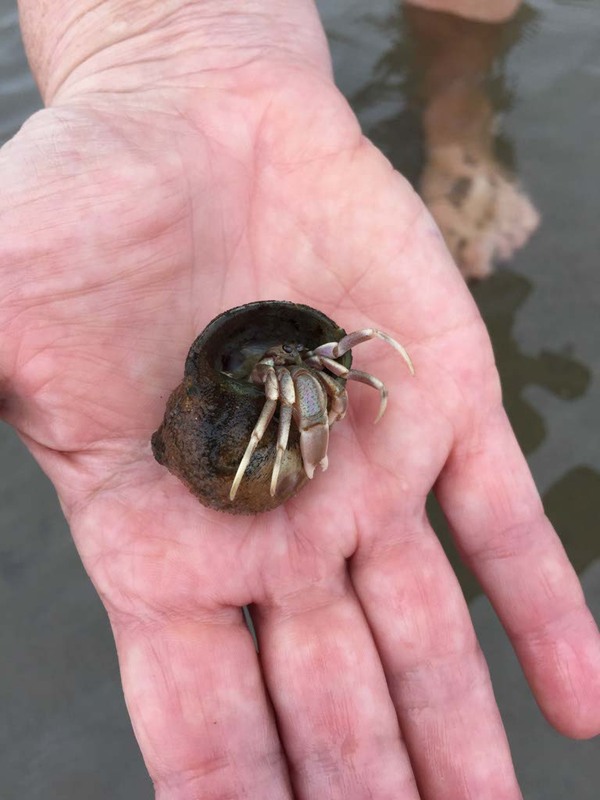 One of my favorite parts of visiting the beach when I was a young kid was searching for crabs, so I’m so glad that this pastime hasn’t been lost on the newest generation – seriously, was the highlight of my day!! Enjoy Parlee Beach, Lesley. We were at Cavendish, PEI, another great beach for kids. Loved these photos They remind me of all the fun I used to have on family holidays when I was younger. The beach was always a fun trip!